I’m a member of a group of Marin county FileMaker consultants. In April we decided to use the group to study for and try to pass the FileMaker 8 Certification test. We bought copies of the big FileMaker Professional Training Foundation Series III book for FileMaker 8. Then we divided the chapters among us with various members choosing chapters to teach to the rest of the group. We met every two weeks for about 3 hours on Monday evenings. In between meetings we did our homework which was to read the chapters and do the practice exercises. At the meetings, we had two presenters for two chapters (along with 2 backups in case someone had an emergency and couldn’t present). One of our members brought his projector and one donated the conference space available to him for our meetings. We met at 6:30 pm in downtown San Rafael and grabbed a burrito, sandwich or ate prior. 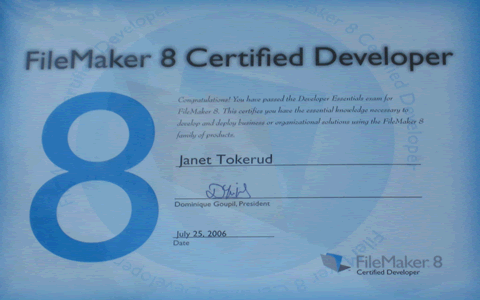 All of us were already very busy with our FileMaker consultancies but we wanted to master FileMaker 8 and figured the certification credential wouldn’t hurt. If others were getting certified, what did that say about those of us who weren’t? It seemed like a perfect opportunity. We agreed that members who had an area of special expertise would teach their strength to the rest of us. Since most of us do training in the course of our work, we had the benefit of some pretty good trainers within our group. Our group was all about sharing knowledge and learning anyway, so why not point it at the certification credential and see what happened? We saw it as a kind of bootcamp team. Imagining that if one of us was struggling to make it over the fence, others of us could help. We had agreed to take the test together at the end of our studying in July. When we finished our studies in mid-July, all but one of us felt ready to take the test. As planned, the day before the test, we did a 4 hour review together on Sunday and then crammed individually that night and the next morning. The five of us took the test on July 24th at 3 pm allowing time for celebration afterwards. Happy Day, we all passed! When you take the test, you are swarn to secrecy (sign a non-disclosure agreement) to not reveal anything about the nature of the test itself, so I have to end my story here. Framed certification certificates arrived by FedEx within the week. It actually looks really good hanging in my office where my clients and colleagues can see it. Of course, probably most important, where I can see it. It felt good to do the work. It was great working as a team. And well, we learned a lot. Filling in the holes in our knowledge where they existed. The learning makes me all the more enthused about FileMaker 8.5 and FileMaker in general. I’m really enjoying my development work these days. The kick in computer work has always been that feeling of awe and accomplishment when you build something really cool. I’ve got lots of neat tools (toys) to play with these days. They make me look good. This entry was posted in FileMaker 8 on August 4, 2006 by janet.